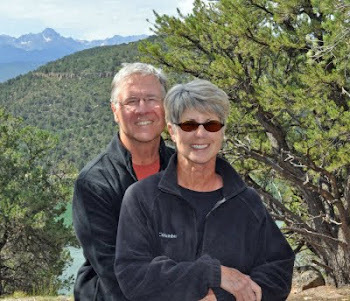 Find us on Google+ Rick and JoAnne's RV Travels: A Bear! A Bear! A Bear! A Bear! And not just any bear…but a grizzly!!!! We decided to take a long drive over to Lamar Valley with the hope of seeing some wildlife, and then drive to Cooke City, Montana. This area is so beautiful, and very different than the other parts of Yellowstone we had seen. We did see lots of bison, but really not much of anything else. We arrived at Cooke City, a place Lois & Hal had ridden through back in their biking days. It was a very charming, small town with a wonderful little museum of local “stuffed” wildlife. Rita & Jack had also driven in their car, and this was the place they decided to say good-bye, turn back to camp, and head back home to Anthem Ranch. After a few photos in Cooke City, we also headed back towards camp admiring the most gorgeous scenery and as we were rounding a bend we saw lots of cars stopped and people looking up towards the hillside. So naturally we stopped, with one foot out of the car I was yelling – A BEAR!!!!! A BEAR!!!! And sure enough it was a grizzly just roaming around and eating the plants. We stayed there for some time admiring the wondrous sighting. We were all very excited and luckily Rick had his 300 telephoto lens. After seeing this ideal and perfect sighting, we headed back to the campground and saw an elk. Kind of anticlimactic after the grizzly bear! We dropped Sandy off in the RV, went to the Canyon Lodge for a yummy dinner and drinks! Whew…what a glorious day!!! !